Creativity Bites Back! : Do You Have a Best Friend? Do you have a furry best friend? Isn't s/he cute and adorable? Always there for you, asking very little and giving back a lot? Well, s/he is also lucky of having you. There are thousands of animals that do not have a human companion to love and play with. Or that are condemned to be euthanized because someone concludes that they are not "suited" to live with us (because we, humans, we are soooo nice and well trained, right? Never a rage, never a war.... aaagh, don't get me started!). But I don't want to get derail from the main issue of this post and that is the work of Best Friends, one of the greatest pet sanctuaries here in the US. I knew about them some years ago when I moved to the US. The more I read about them the more impressed I was. I started making small donations when I could and receiving their magazine and e-newsletter, all full of incredible stories. Stories that make you think, feel, love, and more than once, cry (and believe me, I don't cry easily!). Reading those stories and visiting their website I always wondered how many more happy, sad and weird stories they probably witness in a place like that, that shelters hundreds of animals. 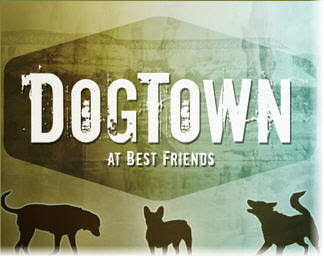 So, I was extremely pleased when they announced the launching of Dogtown, the National Geographic Series that features some of the stories from the real Dogtown, the one that exists in Utah, inside Best Friends. Yesterday, January 4th, at 9 pm EST, Dogtown made its debut with their first episode featuring (among other things) a puppy mill rescue operation. I couldn't help it and I watch the whole episode twice, at 9 pm and at midnight when it was repeated. I am really glad for Best Friends. I am sure this program will give them more recognition, more funds and more help. Because when what you do is unique and special, there is no better marketing/advertising than simply show that uniqueness. That is the case of Dogtown. If you love dogs even a little, you will love this program. 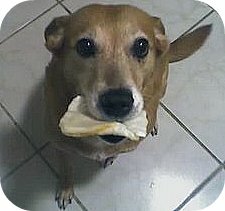 And if you would like to do something for homeless dogs, remember, you can do a lot with just a little: most shelters accept donations starting at $10 or $25, or you can give a little of your time. You can give money, yes, and that is always helpful, but you can also give time as a volunteer in your local shelter or you can donate stuff (like old sheets or pillows or blankets). Get involved. 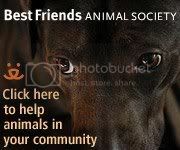 Check with your local shelter or go online and see who you would like to help. New Leash On Life (California and Chicago) Learn about their fabulous "Lend a Paw Program"
Much Love (CA) that works with K9 Connection a great Program that works with kids and dogs. 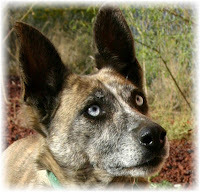 Or browse this list for no kill shelters state by state. Can helping a homeless dog make your list of New Year Resolutions?